Although I’m frequently referred to as a “boundary expert,” the truth is I’m the most boundary-challenged person I know. They say to “write what you know,” and I’ve followed that adage since book one in this series; Setting Boundaries with Your Adult Children. As someone who has experienced extreme boundary violations in life, this current topic is especially close to my heart—and to my senses—as negative thoughts and painful memories can sometimes appear without warning. It takes a concerted effort not to hoard my hurts at times, and I’m not always successful. 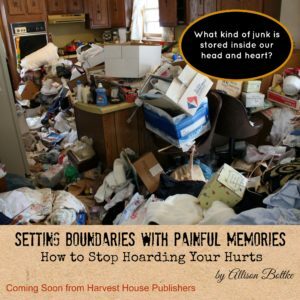 If so, I encourage you to engage in discussion about this topic on my Facebook Author Page where I’ll be giving away free books in the Setting Boundaries series at random times over the next few months as we gear up for the release of Setting Boundaries with Negative Thoughts and Painful Memories. Thank you in advance for sharing your thoughts and opinions.